Webinar Subscriptions If you have several staff who would benefit from high quality & affordable cancer training, which is highly accessible and offers ultimate flexibility, then why not invest in a webinar subscription. You can download a webinar subscription brochure here. Staff can access the webinar anywhere. Maximum flexibility throughout the year. 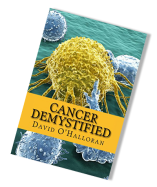 New book 'Cancer Demystified' is out now!